The review below was originally published in 2008, both here and here. You´ll see, however, that, in a second reading, one thing or other can read, for that way true art lies: multiple layers of meaning. Every time you read again a book or watch again a movie, you´re likely to discover fresh, new details, one or two insights. Due to the most recent attempt of polemics regarding the Hugos, I wonder if, people´s choices aside, we should regard every YA book as necessarily "silly" just because it is YA. That is definitely (and most unfortunately) the way things go in Brazil, and, judging by Adam Roberts´s rant, even if he doesn´t think so, it is clear that he think YA fiction should not be mixed with so-called "adult" fiction. To be fair with him, he didn´t say exactly that, and he even wrote that Patrick Ness´s The Knife of Never Letting Go deserved to be in the Hugo shortlist instead of most of the ones that made it. I can´t quite agree with him on this, but that´s a matter of opinion. I agree with him, however, that the Ness´s novel is one of the best of 2008, and should be on the Hugo shortlist - but I can´t in all honesty choose what book I would have to take out of the list in order to put The Knife... in (This would be no more than a game, and a very bad taste one, at that). That said, let´s move -- and concentrate on things less abstract, if that´s possible when talking about so subtle an art as literature. Where do ideas come from? That, it seems to me, is the second most asked question in Literature (the first one being, naturally, what is science fiction after all? - a question no one in his/her perfect mind would dare to answer, because there is no single, simple answer to that). There is no definite, mathematic answer to that question. Tolstoy, for instance, witnessed a woman jump in front of a train, and this suicide led him to write Anna Karenina; Ian Fleming wrote James Bond partly based in his experience for the British secret service during World War II, but chose the name of his agent 007 in a textbook on bird watching, written by a certain ornithologist called James Bond. Sometimes simple, daily things can do the trick fairly well. Such is the case in Neil Gaiman's The Graveyard Book. One day, Gaiman was watching his son Michael strolling around in his tricyle in a cemetery near their home--and suddenly he thought, what if Mowgli (from Kipling´s The Jungle Book) hadn't been raised in a jungle in India, but in a cemetery in England? That was the premise behind The Graveyard Book. As simple as that. But things are never that simple with Neil Gaiman. "It just took me twenty-something years to write it." The wait, however, was worth it. "There as a hand in the darkness, and it held a knife," the story begins. The hand belongs to an assassin, hired to murder an entire family. And that's what he does--except for the youngest son, a toddler who manages to escape from his cradle and crawl all the way to a cemetery nearby. There, he is welcomed (sort of) by the ghosts of the deceased (most of them more than two centuries old, and one or two far older than that). The spirit of his mother, still confused, begs to the ghosts there to take care of her son, and they feel obliged to do so. Time passes, and the young boy (now appropriately named Nobody Owens--the last name due to the family who raises him, an old married couple of dead humble people from the 18th Century) becomes an expert on the cemetery, becoming familiar with every nook and cranny and every grave, even the lost ones including an old pre-historic tomb inside a hill. During almost all of his exploits and little adventures, he is being watched by Silas, his guardian, a being who is neither living nor dead, and the only one besides Nobody who can leave the space of the graveyard. Nobody receives all the education ancient ghosts can give him--grammar and math (both old style, which doesn't really help him), but also some very cool phantom-like tricks including Fading, Sliding and Dreamwalking. In the beginning of his education, he becomes friends with another living person, a girl his age called Scarlett Amber Perkins, and that encounter makes him very happy. This is not Harry Potter at all. But then, I didn't have to tell you that, did I? Not if you already know Gaiman's work from Sandman to Coraline, but also encompassing Stardust, Interworld, and Fragile Things. The Graveyard Book is not about the dead; ultimately it is about the living, about life and what you choose to do with it. Nobody Owens learns about the basic things of life and death (after living many thrilling, bloodcurdling adventures, both in town and in other worlds), and undergoes a rite of passage that will make a man out of him. It's not a hymn to life, but a bittersweet ballad. It can be read as a fabulation or as a mini-Bildungsroman. And it's good reading too. That´s what Literature is all about. Sometimes I believe labeling books as YA/Adult/Children's is silly. If I like to read a "children's" book does not mean that I'm a child. It means that there is a great plot/storyline and characters. The whole spectrum of YA is so vast that it's hard to split it up and really there could be 100s of catagories. YA essentially covers books for kids from 8-18. If you think of the scale of a child developmentally an 8 year old is not the same as an 18 year old so it'll be hard for a book to appeal to both ages and therefore really shouldn't be grouped in the same group. I believe that if a book has the appeal such as Graveyard book to any age no matter if your 8 or 100 it should be able to be considered for an award. Just because of the silly YA rating it's being looked as as "less" of a book, but if you asked people why they liked the book they list the same exact reasons as if it were an adult book. I concur. The Graveyard Book and The Knife of Never Letting Go (btw, what a GREAT title!) are two excellent books, period. In some cases books are moved back and forth from adult to YA or the other way around according to where the publishers thing they will hit better sales. Hi, great review. Just wanted to add something to the discussion here. 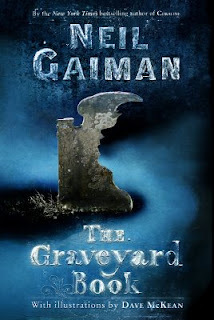 I am definitely not a child anymore, but I still have enjoyed the book immensely.The Graveyard Book is obviously inspired by the Jungle Book, which is considered a book for YA. There are always many levels of interpretation for a good novel, so that it should be readable by everybody and anybody will get something different from it.